The Client Manager feature allows the administrator to convert Windows devices running Windows XP up to Windows 8.1 into a Thin-Client-like OS. To do this the administrator must first select to manage devices connecting to the farm. In order to be managed, Windows devices must be running a current version of the Parallels RDP Client for Windows. Below are the procedures required to connect the Parallels RDP Client for Windows to a Farm and further enroll and manage the device. First, download the Parallels RDP Client for Windows from: https://www.2x.com/ras/downloadlinks/ and double click to run the ‘ 2xclient.msi’ or ‘ 2xclientx64.msi’ and proceed through the installation Wizard (install the 64 bit version on 64 bit Windows). Upon completion, the Windows device will appear in the Devices list shown from the Client Manager category and have access to published resources. Features such as Power Off, Reboot and Shadow require that the Windows device is managed. Windows devices can be set to automatically be managed by your farm or require that the admin approves them first. The device state will change to ‘Pair pending’ until the device reconnects. Ensure the Client Manager Port is enabled from Farm > Gateways > Select gateway > Tasks > Properties > Network. If disabled, the device will remain in a “Pair Pending state”. Once the Parallels 2X RDP Client reconnects, the enrolment process is completed and the device state is updated to ‘Logged On’ which indicates that it is managed by 2X RAS. The administrator can now check the state of the device and perform power control actions such as Power On, Power Off, Reboot and Logoff. Note: Devices running outdated versions of the Parallels 2X RDP Client cannot be managed and are marked as Not Supported. Shadow a Windows device to gain access to the full desktop and control applications running locally on the system as well as any remote applications published from Parallels Remote Application Server. Note : The Windows user will be prompted to allow the administrator to take control and can choose to deny access. The Request Authorization prompt can be deactivated by the administrator from Client Manager > Devices > Select Windows device > Tasks > Properties > Shadowing. In addition, shadowing requires a direct connection between the machine from where the console is running and the device itself. The Replace desktop option limits users from changing system settings or installing new applications. Replace the Windows Desktop with the Parallels 2X RDP Client, to convert the Windows operating system into a thin-client-like OS without replacing the operating system. This way, the user can only deploy applications from the 2X Client providing the administrator with a higher level of control over connected devices. Additionally, Kiosk Mode limits the user from power cycling only when enabled. Note: This feature requires an administrative password set to switch between user and admin mode on the Windows device. If Use Group Settings is enabled, settings are inherited from the group that the device belongs to. In User Mode, the user is restricted to use only the applications provided by the administrator. In order to change system settings, switch the device to administration mode. Change to Admin Mode by right clicking on the system tray icon, selecting “Switch to admin mode” and providing the password configured. The above table outlines features available in Admin Mode and User Mode. With the Replace Desktop option enabled, the administrator’s target should be to deploy remote applications or remote desktops and use the native OS simply to deploy the software needed to connect remotely. However, in some instances local applications may be needed. The administrator still has the ability to configure local applications to be shown within the Parallels RDP Client Desktop Replacement, however it is necessary to switch to admin mode prior. Shadow the user’s session or use the user device station directly. 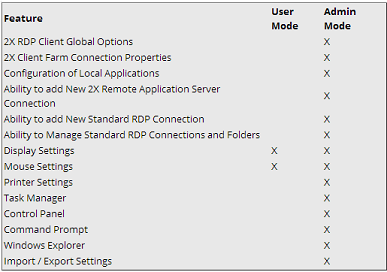 Switch the Parallels 2X RDP Client Desktop Replacement to admin mode. Applications added will be visible in the Application Launcher. Switch back to user mode once all the applications needed are configured.